In the old days, if you wanted a solar panel, you had to buy one of those giant clunky things that were not only pricey, but also a real pain in the you-know-what to install. But times have changed, thanks to companies like Voltaic Systems who are leading the charge with a new generation of affordable, durable, and portable solar panels. When they heard that I was converting my Ford Transit Connect XL into a self-sufficient live and work eco-mobile, Voltaic generously donated a pair of 17-watt solar panels, along with accompanying V72 batteries, that I can use to charge my cell phone and laptop far from any electrical outlet. I decided to pop them on the roof of my van and turn my van into a lean, green live-work machine. And the best part? I didn’t have to drill a single hole in my van to install them. When it came time to install my solar panels, I was concerned that I might have to drill a hole in my van, which is not yet paid for, but my brother-in-law in Colorado helped me figure out an alternative plan. Gather all the materials you’ll need for installation. Attach the powerful neodymium magnets that come with the solar panels to the back of each panel. These will keep the panels attached to the roof when the van is stationary, allowing me to work inside the van—as long as I have a cell phone signal that allows me to access the internet through my smart phone’s hotspot—and when I’m driving, I simply pull the panels off and store them. Feed the wires that connect a panel to a battery through the van’s door gasket so it can be attached to the rooftop solar panel. The battery sits very handily on a shelf below the ceiling, drawing power from the panels directly above. Plug the laptop into the battery, and get ready to work. When I was in Hesperia, California, learning how to build earth houses with Cal-Earth, I accidentally left one of the solar panels on the roof when I left to run an errand, and it was still there when I got back an hour later, even though I’d traveled up to 60 mph on the local freeway. I don’t necessarily recommend that you do the same, but suffice it to say the magnets are very effective. It takes, on average, about six hours to fully charge a battery with energy from the sun, and one hour in the sun provides roughly an hour of laptop time. This varies of course, but two panels and two batteries are more than I need to work 8- or 10-hour days. Getting off the grid has never been easier. This is great! Solar panels that will work not another ridiculous concept design but a functioning efficient use of solar panels. Well done!!! This would be great for a tiny house but almost silly for a van. A better way to go is simply add a second car battery. 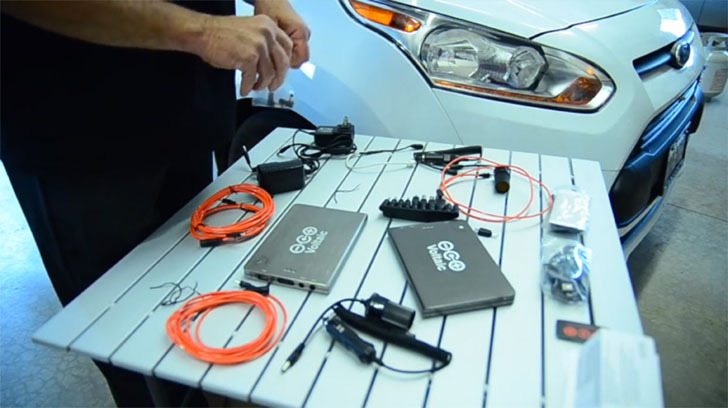 It's cheaper and you can wire it with an isolator so that the van charges both batteries when it's running but only draws power from one to run the car systems. Leaving you the spare battery to run anything you want from phone chargers to laptops and so on. You can use cigarette lighter outlets for your 12 volt stuff and a small inverter for stuff like laptops. I have a system like that in my truck and I can run a GPS, my phone charger and a laptop for about three days on a single charged car battery. With a larger inverter you can run pretty much anything you have in your house for a while without starting the vehicle. A solar panel would make sense for a camper which has no reason to be started for days or weeks at a time. In the old days, if you wanted a solar panel, you had to buy one of those giant clunky things that were not only pricey, but also a real pain in the you-know-what to install. But times have changed, thanks to companies like Voltaic Systems who are leading the charge with a new generation of affordable, durable, and portable solar panels. When they heard that I was converting my Ford Transit Connect XL into a self-sufficient live and work eco-mobile, Voltaic generously donated a pair of 17-watt solar panels, along with accompanying V72 batteries, that I can use to charge my cell phone and laptop far from any electrical outlet. I decided to pop them on the roof of my van and turn my van into a lean, green live-work machine. And the best part? I didn't have to drill a single hole in my van to install them. 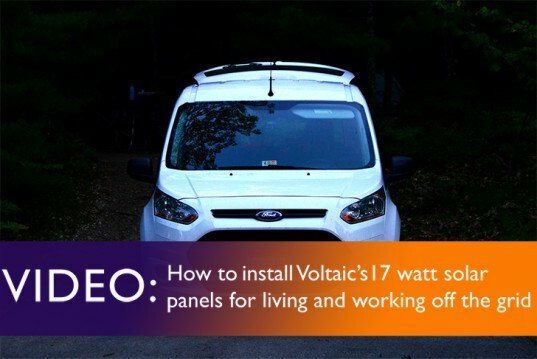 This video shows how easy it is to install Voltaic solar panels in your car or van so you can live and work off-grid. All the supplies needed to install the panels. Installing magnets on the back of a solar panel. Draw the battery cord through the door frame and attach it to the panel. Just plug a laptop into the battery, and it's time to work! The panels sit perfectly on top of the van's roof. The panels are lightweight, flat, and portable. Another view of the panel, standing upright.